The Electric Chocolate Temperer hold 4kgs chocolate to melting at one time, made by Stainless Steel, Hot Air heating system is difference with brain-Marine system machine. We also offer 8kgs Chocolate Tempering Machine and 18 kgs machine. 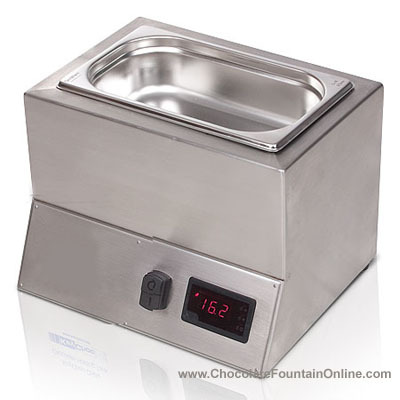 You can check our brain-Marine system chocolate melter here. Processing time: 15 days for this machine. Do not fill the machine with water. The temper machine are all air heated. They are not bain-maries and there for they must not be filled with water. 3. Fill the vat/vats with the required quantity of chocolate and allow to melt. Regular stirring will help to speed up the melting process. overnight to melt, ready for the next day’s production. If wan to buy one and im from kuwait can you tell me how ? Hi,Olly, The tempering machine use Air-Heating System, we offer discount buy one commercial fountain with 2 tanks chocolate melting machine (bain-marie heating system). You can choose one and let us know to check it for you.